When I ate scrambled eggs in Europe for the first time, I was confused. They were delicious. But eggs aren’t delicious–you just cover them in ketchup and slam them down. Not so in Europe, thanks to strict agricultural regulations that basically enforces an organic ecosystem. I think I ate eggs like four times per day while in Europe because they were that good. When I returned to the U.S., it was even harder to force down disgusting Publix eggs every morning. I started trying various organic brands and they weren’t much better. 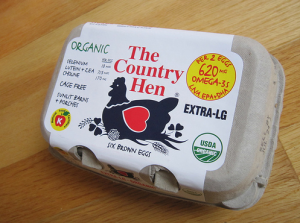 I ran across Country Hen’s eggs in the grocery store and gave them a shot. The first thing I noticed is that the yolks were a darker orange, which is how the European eggs looked, whereas most American yolks are a bright yellow. I scrambled them up and was amazed at how much they tasted like what I was missing. They’re really good. Fortunately, my local supermarket carries them. If yours doesn’t, you can order them direct from the company.